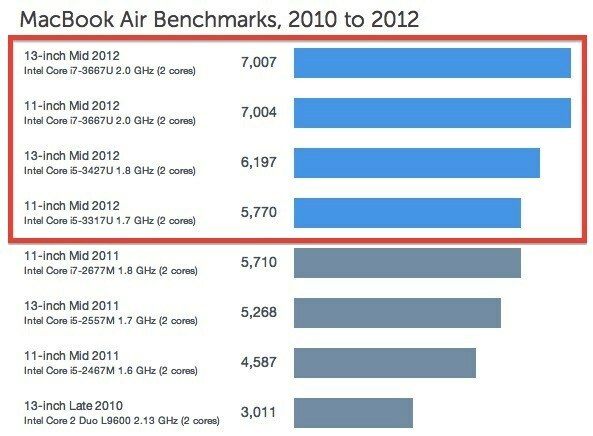 How Fast Is the 2012 MacBook Pro, 2012 MacBook Air? Apple is building its latest MacBook Pro and MacBook Air models with Intel’s latest chips, and just released benchmark data covering Cupertino’s newest kit shows a nice though not show stopping increase in performance. Fundamentally, paying the same money as last week gets you a faster Mac. Geekbench folks have updated their eponymous multiplatform benchmarking tool to be compatible with Apple’s newest consumer and pro portables. Further, they put the new MacBook Pro (above) and MacBook Air (below) models through their paces — processor and memory testing only — and the performance is indeed better than comparable Mac portables from last year. “As with the new MacBook Airs, Intel’s new Ivy Bridge processors bring noticeable performance improvements to the new MacBook Pros,” writes Geekbench. 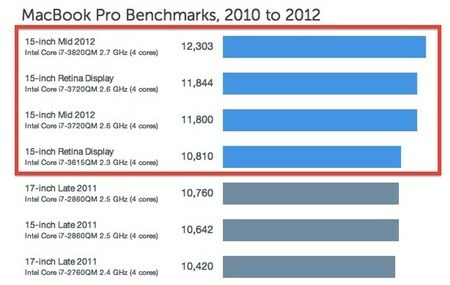 “Also worth noting is that both the regular MacBook Pro and the Retina MacBook Pro use the same processors. Users trying to decide whether to get the thinner Retina MacBook Pro won’t have to worry that it will be slower than the regunar MacBook Pro.